Thank you everyone who has and will support this event. 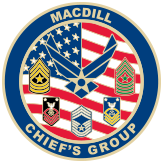 Your contributions are tax deductible and will help improve the quality of life for our men and woman in uniform at MacDill A.F.B. in the next year. 4 Man Scramble Format The four-man scramble features teams of four players competing against one another. In this format, each team’s players hit from the teebox, then the team members choose the best of the four shots for the next shot. All team members then play the second shot from that location, and again choose the best shot. Play continues in this manner until the hole is completed. The team then records its score and maintains that format for all 18 holes.